I wrote "12 Beliefs" because I struggled to create my own path in an uncertain and constantly changing world -- despite two engineering degrees, a Harvard MBA, a commission in the United States Air Force, and senior leadership positions in the corporate world. 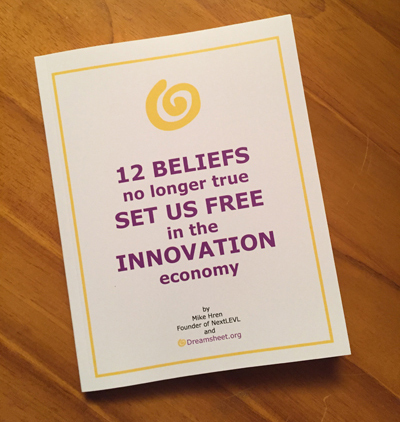 How does our belief system hold us back or set us free in the Innovation Economy? What is the source of all tangible and intangible wealth? Why do our darkest days always precede our biggest breakthroughs? Today, we are all called to create our own path. We are living in the greatest economic transformation ever. Constant change, constant learning, and constant creativity is required today -- even if we just want to be successful in our job. In today's Innovation Economy, we all have access to the same information and tools. Today, only our out-dated belief system holds us back. Our beliefs lag reality in a fast changing world. The beliefs I learned at home, school, and work came from the slower-change Industrial Economy. Our belief system is invisible to us but incredibly powerful. Our beliefs determine our actions -- and the results we get. In this book, I share very personal journal entries along my creative journey -- and a new theory for how all tangible and intangible wealth is created today. I will share a mental model of wealth creation that made sense of my darkest days -- and will make sense of yours. My goal is to make your creative journey easier than mine. What is really happening in our economy today? 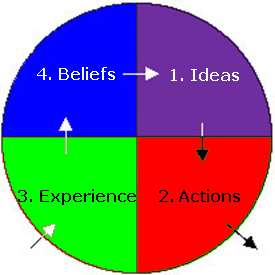 What are "beliefs" and why are they so powerful? What makes entrepreneurs like Bill Gates, Warren Buffett, and Jeff Bezos different from the rest of us (it's not money)? What beliefs did we learn at home, school and work that hold us back? How can we disrupt these beliefs and accelerate our growth? What is the new economic theory for how wealth is actually created in the Innovation Economy? What is our core common calling as human beings? Get a first edition signed copy while supplies last! The price of the book is $10 + $2.75 for shipping. Just click the "buy now" button to be taken to a secure Paypal payment page to use Paypal or your credit card. We ship the books USPS first class on the next business day. Thanks for buying our book! If you have any comments, questions or concerns, feel free to email me at mike@NextLEVL.net. I'd love to hear from you! ©2019 NextLEVL, LLC. All rights reserved.